Rear Suspension Dual shock 5-way preload adjustment. The styling approach of Yamaha's most recent street offerings has taken a turn away from the conventional. There was a time when all bikes were created equal i.e. RD250, RD350 etc, but that changed when Yamaha decided to do some trailblazing by chopperising their more popular road equipment. 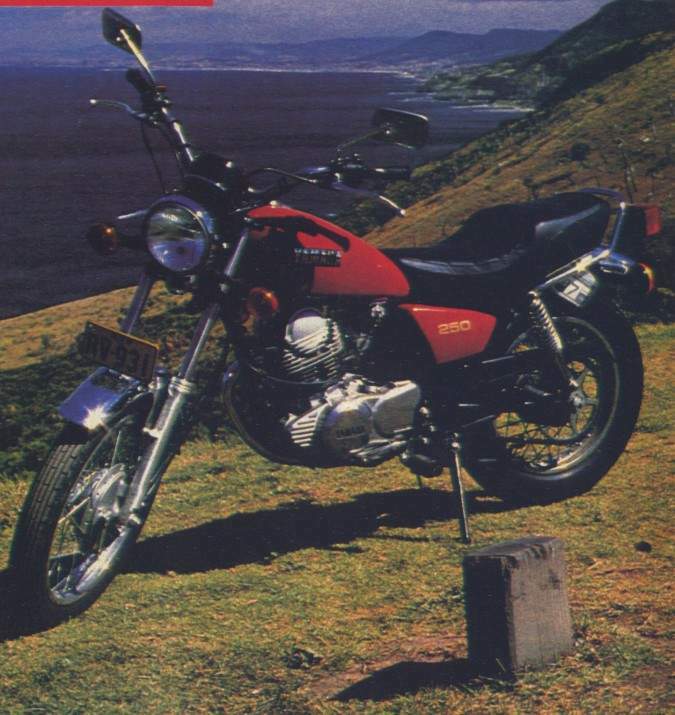 The first "revised" model to reach Australian shores was the Yamaha XS650SF, (TWO WHEELS January 1979) — a high-bar, low-seat version of the ever-popular 650 twin. Following that came mildly chopperised XS400s, 750s and 1100s. Their most recent offering retains the style of those former machines but combines several lessons learnt from past experience. The SR250H is quite a mixed design. Yamaha has tried to capitalise on the success of the SR500 theme, i.e. design a dirt four stroke single and turn it into a roadgoing machine. The demand for a road single was very strong once XT owners realised their dirt bike almost did a better job there than on the dirt. This was obvious from the number of pseudo-roadgoing XTs appearing with smooth tyres and flat bars. It's surprising Suzuki didn't realise the potential and convert their SP370 to street trim also, but that's another story. Yamaha has designed a first-class 250 cm3 single trailster and without hesitation, re-employed the engine and frame in a roadster at the same time. An added advantage is the fact that the laid-back styling may increase the appeal of the machine to non-bikers. Economics also played a major role in the design of the 250 and, all factors considered, the machine is very attractively priced and quite cheap to run. But, best of all - just like the 650SF, the SR250H looks just a little bit butch. Engine and performance In a similar fashion to the XT/SR500 Yamaha series, the SR250 shares most of is engine and frame design with its dirt bike counterpart. The obvious visual differences are the lack of matt black engine enamel and the addition of low slung megaphone style exhaust, but engine changes go deeper than that. Internally the SR looks very similar to the XT, with a bore and stroke of 73.5mm and 56.5mm respectively giving a 239 cm3 displacement. The engine is decidedly oversquare (by about 30%) yet gives very usable low £peed torque. Compression ratio is a moderate 8.9:1. At the bottom end, a built-up crankshaft runs in single row deep groove ball bearings whilst the big end of the connecting rod wears a needle roller bearing. Cylinder head design is quite conventional with only two valves operated by a chain drive from the main crank. To improve efficiency and reduce friction, the single overhead camshaft sits in a set of deep groove ball bearings instead of the usual bushed bearings or plain alloy. Engine vibration is not too bad. Yamaha uses a gear driven counter balancer which works efficiently at low rpm but not so well towards the high end. bike with such a short exhaust pipe. Further major changes include a larger carburettor. Yamaha has used a 34mm constant velocity unit rather than the slide/needle 28mm affair fitted to the XT. Throttle response with this carb is good and the change shows markedly in the reduced fuel consumption. In line with the totally uncomplicated feel of the SR, Yamaha has installed an electric starter and disposed of the kick mechanism altogether (what a good idea for the XT). This modification has required major alteration to the front of the crankcase to house the starter motor. Some other modifications include the plugging of the kick starter hole and the removal of the XT's decompressor mechanism. Performance of the bike feels substantially better than it looks on paper. The SR will accelerate quite rapidly and smoothly in almost any gear without fuss. Its maximum torque comes in at between 6000 and 7000 rpm and it's a very usable powerband for city work. Unfortunately, the open road does test the limits of the SR. Its single cylinder's power does not match that of twin cylinder 250's and therefore under hard work conditions, the bike starts to show its limits. For example, we found that two-up and into a strong headwind the SR was stretching to hold 100 km/h on the flat in top gear. This failing could be put down to two things, i.e. the low engine specific power output of 41.0 kW/litre and the high weight to power ratio to 21.5 kg/kW, both of which give a 15% advantage to the CB250RS Honda. One very impressive note though is the excellent fuel consumption. Our test bike achieved a best touring consumption of 29.2 km/I (82.4 mpg), slightly less than the 250RS Honda at 30.2 km/I. City riding returned 27.5 km/I (77 mpg), substantially better than 24.3 km/I for the 250 Honda. Overall we averaged 27.8 km/I (78.5 mpg) out of the SR250 which is very good for the type of transport it provides. The dragstrip running and dynotesting of the SR250 was plagued with many problems because of the lack of a tachometer. We solved the dynotest problem first (an explanation later) which in turn allowed us to cross reference the bike's roadspeed with an actual engine speed in each gear. So we did have, in a roundabout fashion, a tachometer for running the bike on the strip. From the resulting figures, the SR250 was a consistent performance machine. The best time of 17.2 seconds at a terminal speed of 119 km/h appeared quite frequently throughout the testing session. The running of mid 16's put forward in other road tests appears too fast considering the fact that the similarly equipped and geared XT250 could only run 17.6 sees (TWO WHEELS June 1980). Best performance was obtained using slight clutch slip at the start just to keep the engine over the 6000 rpm mark. Gearchanges were made at about 8500 rpm (according to the speedo) and the final run to the finish line was in fifth gear at approximately 7700 rpm. As mentioned previously, on the dyno we had to measure the engine speed without a tacho. This did present some problems. An electric tachometer had to be wired into the firing circuit and cross-referenced with the true rear wheel speed. This arrangement then allowed us to match bike roadspeed with engine revs in each gear. The test figures we achieved were as predicted, i.e. rather lower in all cases than the four-valve RS250 Honda. Maximum power of 9.8 kW is produced at 8000 rpm and torque peaks at 7000 rpm with a value of 12.3 Nm. Honda models. Actuation is by the trail-bike style rack and pinion system which usually gives good feel and does give light lever action. Throughout the test we encountered no problems with the SR's clutch and found it adequately specified to take the load put through it. Gear ratios turned out to be well chosen for road work considering they were originally designed for trails. Our slightly higher self-imposed redline of 9000 rpm allowed the SR to run to 43, 67, 90, 114 and 139 km/h in gears 1 through to 5. Top gear as mentioned previously did find the going a bit tough under hard riding conditions and one could not expect to cruise comfortably on the open road at more than about 120 km/h. Gear-lever action was light and positive with no false neutrals dispersed throughout the gears. Neutral itself was very easy to find and maximum change points could be felt from the power drop-off of the engine. Overall, a well proven setup taken directly from the trail bike version. The general stance of the SR250H gives a good indication of what the suspension will probably be like. For example, the long travel (140mm) front forks do give a nice, well-sprung ride with adequate extension to dampen nearly all suburban road bumps. Damping is well catered for and the front wheel stays where it should under heavy braking or cornering on uneven surfaces. Rear suspension is somewhat more limited with only half the amount of travel of the front forks (70mm). The rear consists of KYB shocks inclined moderately forward and surrounded by a variable rate spring. Spring preload is adjustable over five settings and generally the second lowest setting is adequate for one-up city riding. Two-up (depending on the road) needs the highest setting to retain the bike's original handling characteristics. With a passenger present, the combined load might pass through a position directly above the rear axle. This does not do anything for the bike's handling. One up, the bike does handle well around town, once one is accustomed to the light feel of the front end. The riding style suits commuter riding ideally with almost every rider being able to place his or her feet squarely on the ground (every bike rider's dream). Medium and high speed cornering is quite steady due mainly to the bike's low centre of gravity. The bike can be thrown around with some confidence. Design economies in the SR250H first creep up in the brakes. The bike comes equipped with a single-leading-shoe drum brake at both front and rear. The front brake is cable operated and the rear, rod operated. Since 80% of the braking effort is taken by the front brake, we were somewhat worried by the half-width drum rather than the more usual single disc setup. In fact if it wasn't for the size of the front wheel, one would suspect that this was lifted straight off the XT. These fears were not particularly justified. In the 60 km/h to zero stops, the SR fared very well when compared to similar but better equipped machines. Our best stop of 12.1 metres was very close to that obtained by the Honda 250RS with its front disc setup. Over the higher speed stops, the limitations of a half width single-leading-shoe brake did become obvious. Quite dramatic drop-off of braking power was felt even during the first hard stop from 100 km/h. The cable operated front brake, although providing good feel and easy leverage, had to be adjusted up mighty high to stop the brake lever from being pulled onto the handlebars. Front brake lockup was not the easiest thing to do but the rear wheel could be stopped fairly easily. The extra distance caused by the brake fade is notable, i.e. 37.3 metres for the SR250H versus 34.4 metres for the CB250RS. Wet weather braking is not too bad providing the drums don't get soaked, and if that happens — forget about stopping at all. Throughout the braking session the SR didn't give any dramatic breakaway performances and from that we concluded the bike was pretty stable under heavy braking conditions. The most striking aspect of the SR250H is the quite obvious low budget look about it. Lets face it, to knock out a 250 single for around $1300, one has to really get serious about savings. For that reason, the SR250 does have a spartan appearance — just a straight single colour (non metallic) paint job with a Yamaha badge on each side of the tank and a 250 decal on the side covers. Wire wheels complement the look. The most notable omission is the tachometer. There are no super-looking square indicators (although those fitted do bend), and beautiful pinstripes along the tank are definitely out this year. What the SR hasn't got doesn't in any way prevent the bike from doing what it was designed to do, i.e. provide economical transport for the novice or experienced rider. On the positive side, engine appearance is very good, the alloy work and finning are of high quality as always. Chromework on the exhaust pipe is very good and overall the appearance of the powerplant is appealing. 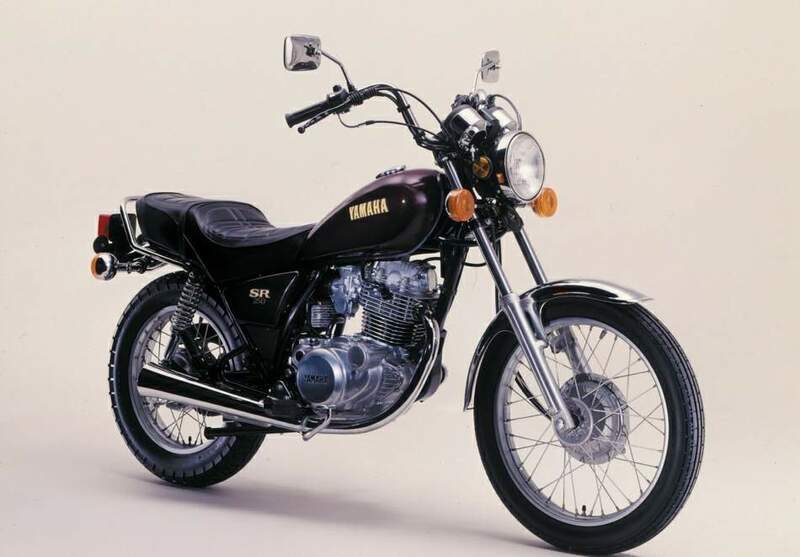 We liked the inclusion of electric starting, the electronic ignition and the larger more economical carby — obviously Yamaha had their priorities right when they started to save dollars. Riding position, as mentioned previously, is good but long-legged people could find the leg angle too acute when feet are on the pegs. The large, wide and high handlebars give very good steering leverage. Thankfully they aren't rubber mounted like those on the 650SF Yamaha. One grievance with the bars is that once in the riding position, one's elbows just hang there and get tired. The forearms are neither straight nor are they supporting any of the rider's body weight, as they would be under normal conditions. Out on the open road the situation gets worse and after about an hour's riding the rider's forearms are usually very tired. A nice set of flat bars would most likely solve the problem. The seat is also too short and fat to provide comfortable accommodation for passengers. Most pillion passengers end up sitting on the grab rail behind the seat wearing their knees around their chest because of the high footpegs. Instrumentation well what can you say? A zero to 140 km/h speedo is all you get — no trip meter, no tacho, in fact the speedo looks like the type they used to use on those early Honda step-throughs. Controls are well placed and include auto-cancel indicators, kill switch, headlight flasher, electric starter and steering lock integrated with the ignition switch below the speedo. Other notable features are the bend-able indicators, trinkets box (which I always thought was a fuse box) found between the handlebar mounts and a sight glass for engine oil. The styling exercise of Yamaha's SR series has proven popular with the 650, 750 and 1100 models, so there seems no reason why the SR250 should not find the same acceptance. Of course its acceptance is limited by the laid-back appearance which would obviously not appeal to everyone. Possibly the sheer practicality of design, ease of operation and economy is really what will grab the buyer, because in that area the SR is tops. Almost anyone from learner upwards can hop on the bike and feel at ease with it. The low seat, easy to reach bars and smooth torquey delivery of power from the 250 single engine all combine to make riding the fun it used to be. We feel quite positive that at the price (about $300 less than the 250RS Honda), the SR250 has got to be a winner.